There are some exciting initiatives that are likely to shape our industry in the years to come, in particular, the focus on alternatives and private equity (PE), where we are seeing an increasing number of managers integrating ESG into their investment process and working with the UN PRI on the PE asset class. 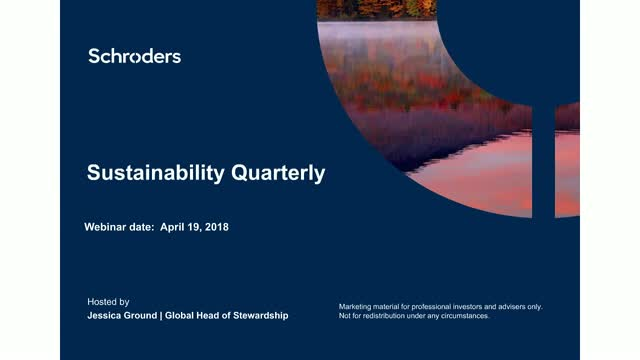 In this webinar, Jessica Ground, Global Head of Stewardship, and her team at Schroders, will discuss the global trends they’re seeing across the leading Asset Owners in this area. On 3 December, the end-of-year results for Schroder European Real Estate Investment Trust will be announced. To coincide with this, please join Jeff O'Dwyer, European Investment Manager, and Andrew MacDonald, Head of Real Estate Finance, as they provide their investment outlook for 2019 and cover the main contributing and detracting factors which have affected the portfolio performance in the last year. On this All Hallows' Eve edition of Schroders’ Sustainability Quarterly webinar, we look at ESG-indexing, and ESG within Emerging Markets, both areas that can potentially offer tricks & treats. EM have tended to exhibit greater volatility than developed markets. Less stringent regulation, rapidly changing demographics and evolving policy environments can add to the uncertainty for EM investors. These issues are less likely to impact better managed, more sustainably run companies, in our view. Join Schroders, 7IM and Distribution Technology for an update on the Wealth Portfolios. During the webconference, you will hear about the Dynamic Planner asset model process and how these exciting fund solutions are uniquely positioned to deliver consistent risk targeted investment outcomes to this framework. Nick Kirrage, Fund Manager, explains why now is the time for value at the Schroders Adviser Investment Forum. Jessica Ground, Global Head of Stewardship, shares her insights on sustainability at Schroders Adviser Investment Forum. Matthew Dobbs, Fund Manager, offers his views on the Asia ex Japan region at the Schroders Adviser Investment Forum . James Sym, European Equities Fund Manager, shares his outlook on Europe at the Schroders London Investment Conference. Jessica Ground, Global Head of Stewardship, shares her insights on sustainability at the Schroders London Investment Conference. Alex Breese, Fund Manager, offers his views on the opportunities available in the UK equity market at the Schroders London Investment Conference.